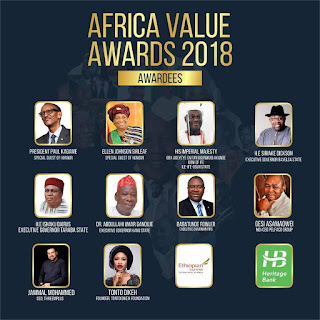 The Africa Value Awards is aimed at honouring prominent Africans and Organisations that have promoted the Value and Positive image of the continent, humanitarian services and have also projected peaceful coexistence in their various countries. The Value Reorientation and Developmental Initiative Africa (VARDIAFRICA) will host the 2018 edition of Africa Value Awards on November 17th, 2018 at the Nigerian Air Force Conference Centre, Abuja. White Nigerian, Ganduje, Tonto Dikeh, former president of Liberia and some state governors are among those to be awarded at this year's edition in Abuja. According to Amb. Obah, Nigeria being the host country will constitute 60% of the awardees while 40% is to be selected from other African countries.